on the 13th to 14th of April in stockholm. Rules and info will be up shortly. !New! After much thinking we thought the more the merrier and we hope you will agree. This has some drawbacks but we think it is totally worth it. Each list mus be played at least twice. Write your name so I know who it is from. Fee should be paid in advance. Foreigners can pay at the venue if it is too much hassle to pay over countries. They will have strong beer and wine on our evening. Because it is a closed company. It will be just us rrom the tournament. If you are under 18, please write so in the letter. This is info for the drinking and eating venue on saturday evening. If you are under 18 it will be no problem being with us on that evening but you will not be able to purchase alchol. Please only post in English for all the other non-swedish speaking people who will read and post. The swedish game store Alphaspel will be attending the tournament both days and will also sponsor the tournament with some additional prices. They will bring an (almost) complete stock of Warmachine/Hordes items as well as soda & candy (no peanuts, we promise). If there is anything you need it might be a good idea to pre-order it from their website. Choose "Övrig utlämning" and "Betala vid upphämtning" as your delivery/payment options. 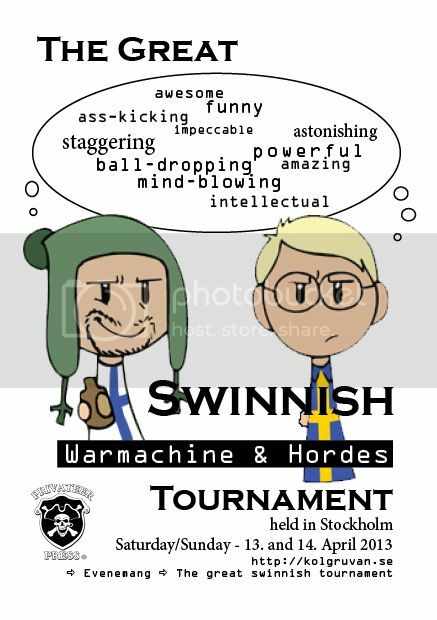 Write "Swinnish Warmachine" as a comment, and the items will be brought to the convention for you. You pay on site, but it is yet unclear if card payments can be accepted, perhaps you will need cash. Howdy Folks! Now you get to know the deadline for sending us your lists. And I would like to notify again that if you are under 18 please make that clear. It is very important for us and for the drinking venue. I'll sign up for a spot in, you know, whatever this will be! If it wasn't clear enough I'm so on. Rakastan suomalaisia!!! Jag älskar dig pojkar också! Can't wait! So much awesomeness with Aros Kingdoms and Sipoo Sausage Fest and this and and and... 2013 should be pretty damn awesome year! Mer info! Är det för utsocknes icke-finnar också? Lets get the sht going.